I can only dream of doing that kind of skiing, but I do dream. >Why do people run marathons? I don’t know. 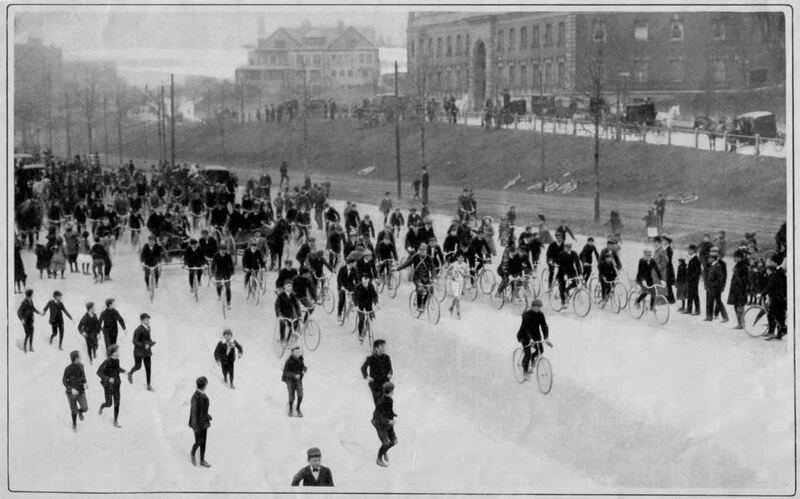 Fans surround race leader in 1904 Boston Marathon. I’ve been thinking about running a marathon some day. I’m a long way from being ready or able to do so (a very long way), but it is a kind of dream of mine. I may never run one, we’ll see. But I’ve also been thinking about the early marathons, that is, those around 100ish years ago. When we think of running a marathon as a formal organized race, that idea has only been around about 120 years even though the inspiration goes back to ancient Greece. In the early days the typical distance was around 25 miles. The thing that has got me thinking is the fact that at a certain point marathons were something new – a novelty in fact. I am reminded of when triathlons were the new thing, especially the Ironman*, which seemed impossible in length yet many people got excited to try it – whether they were ready or not – even though it was like staring into the unknown. 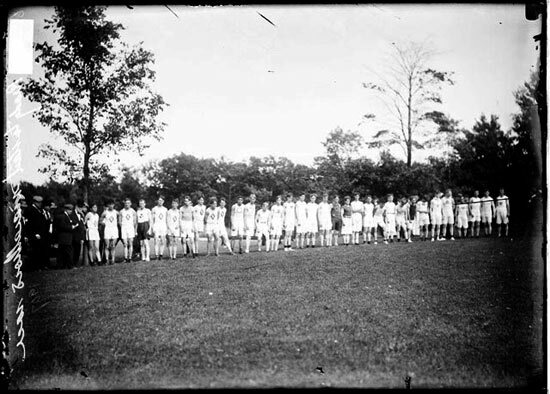 Runners line up before the 1907 Illinois Athletic Club Marathon. Why do people get excited to run a marathon? I want to run one and even I can’t answer that except in vague terms of personal challenge. But I also have the advantage of knowing that many thousands of marathons have been run by millions of people. Still, for me, the idea of running a marathon is like staring into the unknown with a mixture of fascination, desire, fear, and wonder. A hundred years ago marathons were still somewhat unknown. People did not know much about training for them or the physiology of endurance sports. The clothing they wore, especially the shoes, was not suited to running in the the way we expect today. And, I would assume, that the races themselves were not as well managed or supported as they are today. But still runners (only men for years) lined up at starting lines with high hopes and anticipation. 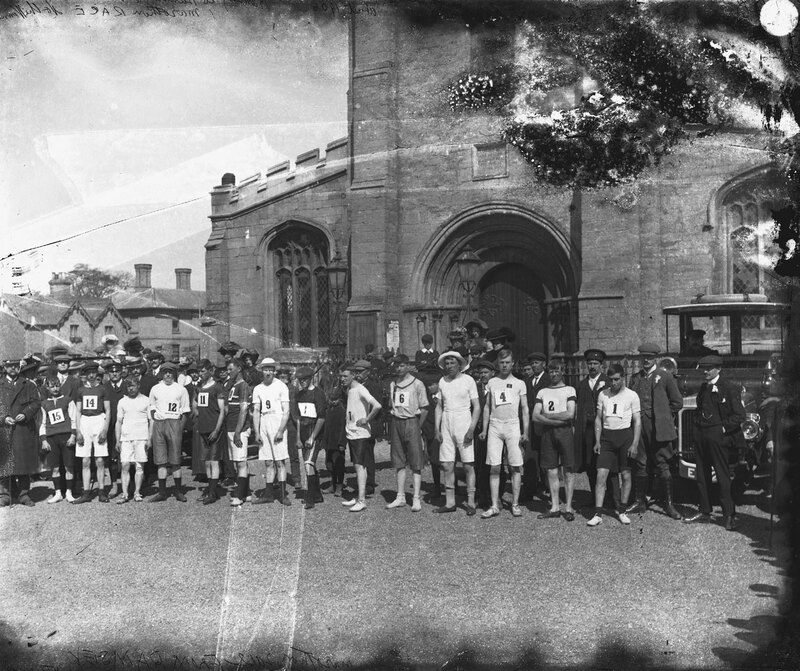 Runners line up before the 1909 Ramsey to Huntingdon marathon. What I find curious is the ways people think about marathons. For many it is a kind of ultimate personal challenge that calls to them. To others they roll their eyes and say they can’t imagine why anyone would even try. I’m closer to the first group, though I have never run a marathon, and looking at me one might think I never will. For many the distance (26.2 miles today) is an kind of impossible distance. Yet I recently posted about a 135 mile ultramarathon race through Death Valley in the middle of July every year – and people show up, run it, and finish. So what is it that attracts people to do seemly crazy endurance events and enjoy them? Those early marathoners were staring into the unknown to some degree. Running 25+ miles was thought to bring one closer to death, a test of one’s willingness to push oneself to the limit. Today we know more, and it’s amazing how many “non-runners” aim for completing one. Yet, even with the huge numbers of people running marathons, and the increase in marathon choices, it is still a mystery why many of us find ourselves desiring to join the fray – even if in the most humble way. * First run in Hawaii in 1978, the Ironman Triathlon consists of swimming 2.4 miles in the ocean, followed by biking 112 miles, and then running a marathon, raced in that order and without a break. This is a human powered vehicle – in other words one pedals to make it go. The chassis is aluminum. The first one was designed and handbuilt in the 1980s. Since then several models have been developed, including one with a carbon fiber chassis. They are built in Europe, but kits can be ordered to build one yourself. Unfortunately, they are far too expensive for my budget, but I can dream can’t I? I would smile too if I had an Alleweder. 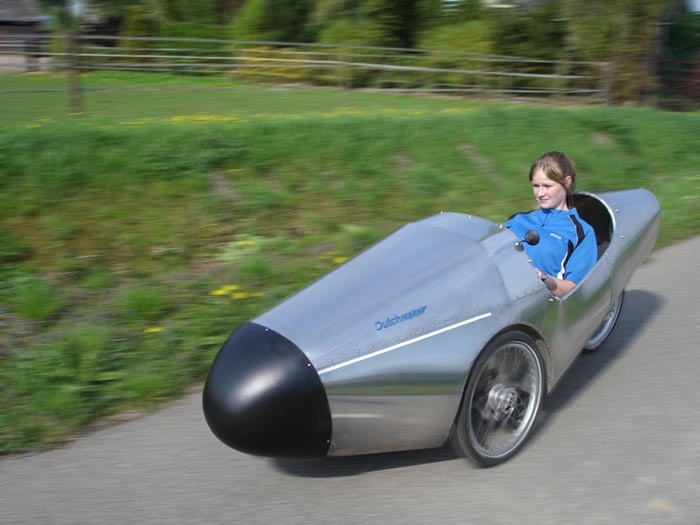 >I just wrote a post on bicycle speed records and the really cool human powered streamliners. That got me remembering to my childhood and one of the most amazing accomplishments that got my attention – human powered flight and specifically the Gossamer Condor. I want a plane like that. That was in 1977. It’s amazing how far we’ve come in technology in general since those days, yet the Gossamer Condor still look state-of-the-art. >How fast can a bicycle go? >I remember when John Howard broke the land speed record for a bicycle in 1985. I thought that was the coolest thing ever at the time. He did it by having a modified car tow him up to a minimum speed so his high gearing could begin to work and having the car block the wind for him while he pedaled in the still air just behind the car. He reached an amazing 152.2 MPH. That record was broken later by another cyclist using the same basic technique. But what if no fossil fuels were present? What if one had to start from zero without being pulled up to a ‘starting speed,’ and then continue pushing through the wind yourself? That is the real test for bicycle and human powered vehicle speed records. I have to say I would LOVE to ride in one of these bikes. Years ago I once rode a recumbent. It was a lot of fun, but a little strange too. Nowadays I see lots of recumbents and human powered vehicles. But it would be so cool to pedal a streamliner bicycle, even if there’s not much practical application beyond mere speed. >We all have our fantasies. Mine include such things as climbing Everest, racing the Baja 1000, and going for a speed record at Bonneville Salt Flats. None of these things will I ever achieve, but I still love the dream. …and for all of you who ride around on those 50cc scooters that only have a top speed of maybe 30 MPH, how about taking that little engine up to 140+ MPH?